about alasdair | Alasdair Malloy. Percussionist, presenter, glass harmonica player, programme deviser, arranger and more – Alasdair Malloy is a creative musician crossing many musical boundaries and exploring unexpected different directions. Alasdair considers himself very fortunate to have a richly varied and diverse musical life. Trained as a percussionist at the Royal Scottish Academy of Music and Drama, he has now been Principal Percussion with the BBC Concert Orchestra for over twenty years and during this time has been regularly in demand as a guest player for sessions and concerts and for film and television recordings. His BBC Proms solo debut was in 1998 and he has made a number of subsequent appearances at this and other notable music festivals. His fascination for unusual musical instruments led to him become a Glass Harmonica specialist, one of only a handful in the world, and he has performed with his various glass instruments in concerts and festivals in the UK and abroad as well as on recordings for many films and on numerous CDs with diverse artists including Icelandic pop star Björk. 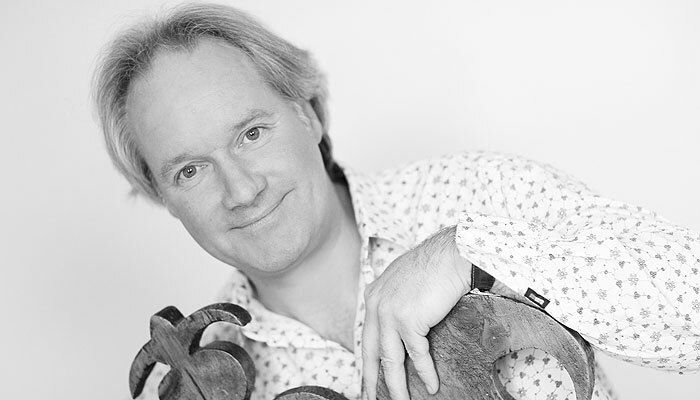 The combination of his outgoing personality, his enthusiasm for all sorts of music and his soft Scottish accent has resulted in Alasdair becoming a very popular presenter of concerts and on television and radio. From his solo percussion show for children, Rustle Up a Rhythm, and the Beanbag Proms, devised for babies and toddlers using a mini-orchestra of 12 players, to concerts with full symphony orchestra, Alasdair has introduced hundreds of thousands of people to music in his very individual way, and is renowned for his highly original programmes which he devises and presents with orchestras all over the world. Alasdair has significant ongoing relationships with several orchestras. In the UK he is a popular guest with the Royal Liverpool Philharmonic Orchestra and has created and presented over 150 concerts with them including creating their Phil Power series, which was Reason Number One, according to Julian Lloyd Webber in the Daily Telegraph, to be optimistic about the future of classical music in Great Britain. Alasdair was Artistic Director of the Adventure Concerts series for the Bournemouth Symphony Orchestra for eight years and appears each season with many of the major UK orchestras including the Hallé, Ulster Orchestra, City of Birmingham Symphony Orchestra, Royal Scottish National Orchestra, The Orchestra of Opera North, Guildford Philharmonic Orchestra, and the London Mozart Players. Abroad, Alasdair works regularly with the Malaysian Philharmonic Orchestra, Shanghai Symphony Orchestra (the première of his highly acclaimed ‘Bugs! !’ won the National Silver Award for best performance in China for children in 2005), the Singapore Symphony Orchestra, Hong Kong Sinfonietta, Orchestre Philharmonique de Strasbourg, Orchestre National Bordeaux Aquitaine, Orchestre Philharmonique de Monte-Carlo and the RTE Concert Orchestra in Dublin. 2010 saw Alasdair make his USA debut with the Charlotte Symphony, which received great acclaim. Many of Alasdair’s programmes feature his own orchestral arrangements and he is constantly adding to his library which includes several medleys and quizzes which are particularly popular as well as many pieces where Alasdair features as soloist on percussion or glass harmonica. Over the last few years Alasdair has been increasingly in demand as a conductor as well as a presenter and he has directed programmes with the London Mozart Players, Sinfonia Viva, the Ulster Orchestra, the Royal Liverpool Philharmonic Orchestra and the Oxford Philomusica as well as his own group: Alasdair Malloy’s Concert Party.